Find the perfect flooring for your home in Land O’ Lakes without breaking the bank! Laminate flooring is available in countless styles and textures to give your floors an authentic look without paying the price for expensive materials. Laminate flooring is also incredibly easy to maintain — a huge plus for people who have young children and animals! At 2 Day Flooring, we offer laminate flooring in a variety of appearances to match your tastes and lifestyle. Whether you want the appearance of wood, tile, or stone, laminate flooring is a beautiful, cost-effective, and low-maintenance option for many. Contact us today for a free, in-home estimate or for more information about our laminate flooring options. If you’re looking for durable floors that are also authentic-looking and beautiful, laminate flooring is one of your best solutions. Messes that the kids make are a breeze to wipe up, and pets that track in mud or have accidents aren’t an issue anymore. Laminate flooring is scratch resistant, stain resistant, and won’t be damaged by moisture. Laminate flooring is designed to look like other materials without losing their shape or appearance. Where other materials might be more susceptible to damage, laminate flooring is easy to clean and maintain, keeping it beautiful for years to come. And because it’s a synthetic material, it can be customized in countless ways. Choose from a variety of colors, textures, and styles to give your home a custom and unique look. 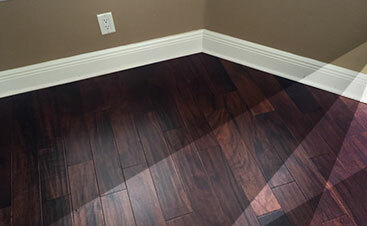 More popular options for laminate flooring are hardwood looks, but stone is another great option that looks authentic. Contact 2 Day Flooring today for our extensive laminate flooring options. There are a lot of pros to choosing laminate flooring for your home. Whether you’re looking for an inexpensive flooring solution, you need floors that are easy to take care of, or you just want to customize the appearance of your floors more than hardwood or stone options allow, laminate flooring is a great choice for many. Laminate flooring can be installed in areas that get used by the most amount of people, like the kitchen, entryway, or bathrooms, but laminate flooring also looks great in any room of the house with its authentic appearance. Have it installed anywhere: the dining room, the bedroom, even the family room. 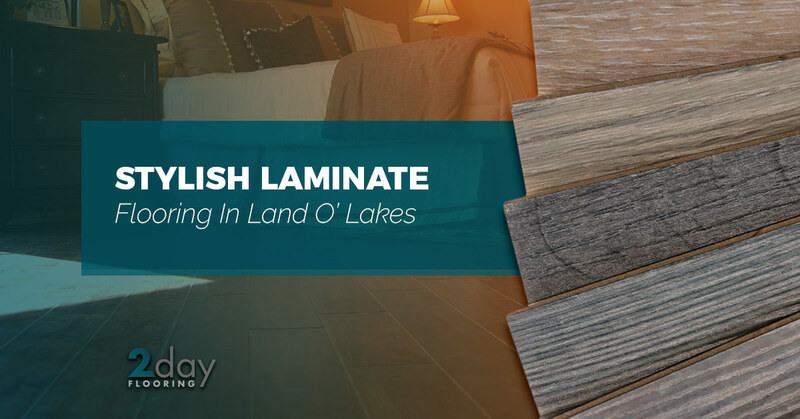 You’d be surprised how classy laminate floors will look throughout your Land O’ Lakes home, so get started today! 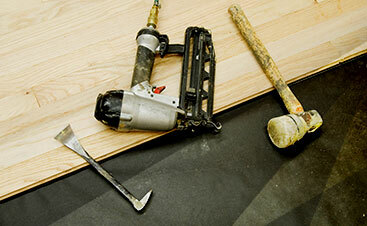 When it comes to having new flooring installed, you want to hire the best of the best to complete the job. We offer free in-home estimates to help you get the ball rolling, and then schedule a quick and professional installation to help you get your renovation finished as soon as possible with amazing results. If you’re unsure of what you want, we can make suggestions based on your home, your budget, and what you’re interested in for appearance and maintenance. We will never try to sell you the most expensive option because we care about your priorities for your home, so contact 2 Day Flooring today to get started!